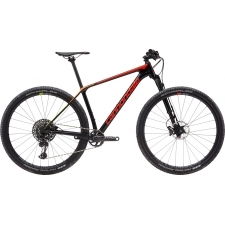 The world's best XC hardtail just got better. If going really, really fast on dirt in lycra is your cup o' tea, nothing lets you top 'em on the climbs and drop 'em on the descents like the all-new F-Si. Only available on F-Si, the all-new Lefty Ocho is a clear advantage over any fork available today. The smoothest, stiffest ultra-light XC fork ever made, it floats through chop and steers through the choss like nothing else. Its 55mm fork offset pairs up with the F-Si's new, slacker 69 degree head angle to create OutFront geometry, giving you extra stability to charge the downs, with full XC agility on the ups. Helping the F-Si track perfectly through whatever you throw it into. Short chainstays do wonders for traction and nimble handling, but they usually come at a cost. That's not the case our proprietary Asymmetric Integration drivetrain offset. By moving the gears and rear triangle over, we create space that enables us to shorten the stays AND still have clearance for big tires and room for 2x drivetrains if you want. It even creates a stiffer, stronger rear wheel by evening out the dish. A faster kind of thru-axle. Slotted dropout design lets the axle stay in the hub for quicker, easier wheel changes. Compatible with standard 148x12 hubs. It’s a better way thru. For seated comfort, designing the F-Si with a 27.2mm seat post was just the start. Our collarless seat post clamp takes it even further, lowering the clamping point so that more of the post can flex. Put the power down all day long, without the punishment. 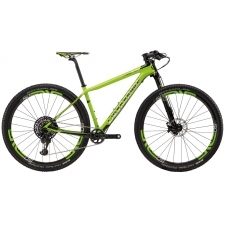 Buy your Cannondale FSi Carbon HiMod 1 29er Mountain Bike 2019 from Revel Outdoors.